“Metadata” is a certain type of data that hold some key information about a file. When considering the file’s integrity, they’re not always terribly important (they are sometimes!). For instance, when you click on an audio file in a music manager, it shows you a lot of data about it such as the Artist, Album name, Year, Genre, Comments etc. It’s the metadata of that audio file that holds those information. So even if the meta data is somewhat corrupted, most of the time the audio should work but metadata has few varieties and depending on the file’s type, the importance of the metadata has a major role to play sometimes. PDF files too uses its own metadata type for inserting data such as Author, Publisher, Copyright data, restricting copying the text or setting the permissions (these type of metadata has a major role to play concerning a file’s integrity)etc. Now most of the time you can use a PDF manipulator like PDF Chain for editing (including splitting) metadata. But since it’s more than a metadata editor and if all you want is something quite simple and dedicated only for that task, then you can try “GPDFtool”. 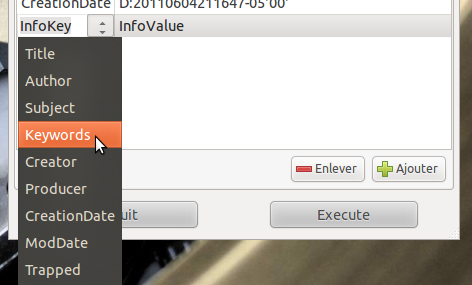 But please remember that, currently this utility only supports French language. So no English version available. Now I too don’t know the first thing about French (I can barely speak English :/) but because this utility is so simple and intuitive even though I don’t know any French, yet within like few minutes I got used to it!. It also integrates into the Nautilus file manager’s context menu so you can open PDF files directly from it. *. Currently there are no “debs” packages. But you can just double click on the executable file to run it. Or if you use Nautilus as your file manager, then you’ll love its Nautilus Script which makes the whole thing a hell lot easier. *. Reads and shows you the metadata of a PDF file: Creator, Title, Producer, Author, Created date, Keywords, Subject etc (and editing them). *. Manually add new fields (if PDF doesn’t have an author property for instance). *. Shows you a basic structure of the PDF file (bookmarks, pages, Titles, Chapters etc). *. Adjust “security” or permissions of a PDF file such as: Change Owner, enable/disable copying the content, change the printing quality, enable/disable modifying the content, ModifyAnnotations etc. *. And finally save the new PDF file in a different location. If interested you can run it in Ubuntu easily (works in 11.10 Oneiric Ocelot, 11.04 Natty Narwhal, 10.10 and should also work in 10.04 and other older versions too I think) by following the below procedure. 1. 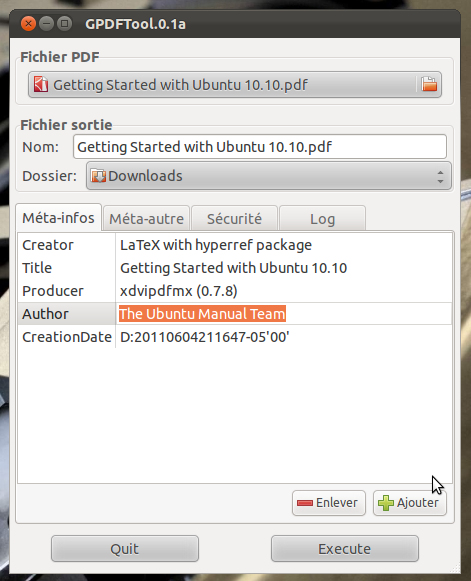 Now this tool actually uses a PDF manipulating library called PDFtk and we have to install it first. For that please use the below command. 2. Now that’s done please visit this GPDFTool forum page (it’s created by an Ubuntu French forum contributor called “AnsuzPeorth”) and get the file first. It’s in French and if you can’t find it easily, then please get it from this Googlecode page (it’s compressed). 3. Then open that file and extract the content somewhere (let’s say in your “Home” folder for instance). 4. 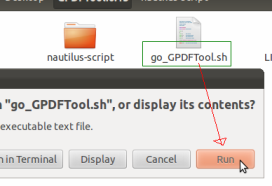 Now go into that folder and double click on the file named “go_GPDFTool.sh”. When asked simply choose “Run” and it should open the GPDFtool. That’s it!. However I recommend that you also install the Nautilus script since it lets you right click on any PDF file and edit its metadata. For that, once inside that folder, you’ll see another folder called “nautilus-script”. 5. 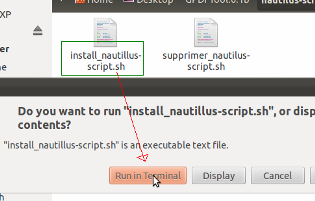 Now go inside of that folder and double click on the file named “install_nautillus-script.sh”. When asked choose “Run in Terminal” and it’ll automatically install that script and exit the Terminal window. That’s it. Now whenever you want, just right click and from the menu choose: Scripts -> GPDFtool and it should open the GUI app. Let’s hope the developer releases an English version in the future as well 😉 (big thanks goes to “AnsuzPeorth” for creating the app). That’s it. I came across this article by chance. Sorry for the English translation, but I'm very bad language (this text is translated by Google, so …). If you want to translate the application, no worries, opens. Glade (with glade3, software for creating graphical user interfaces under gtk, or with a text editor), and mail it to me, I will put in place the system of language or you can also leave it in English, it is not very complicated to use, whether in English or French!). I have been able to develop this software, but since I have not had much feedback to use, I have not continued to develop. Although I haven't really worked with Glade but I'll give it a try and if I figure it out, I'll mail you. Just give me little more time :). Oulah, you have all your time. I work a lot on my real app, glade2script, it asks me a lot! Moreover, thanks to GPDFTool running this software. If you developed in bash or python, you could use glade2script! Thanks Ansuz!. I updated the post. I'm not a programmer though, but thanks for the suggestion :). Could you update the link to your article, like this all the readers of your blog will enjoy your translation. You can, if you want, just specify the download page, that way if there is something new, users can choose the latest version. Done! :). I also wrote a post about the new English version as well. Was so useful to me. Just i was looking for. You’re welcome joaquín 🙂 . Thanks for the fantastic article! GPDFTool works great but it was lacking one or two features, so I decided to write an application of my own. I would be glad if you gave it a try!